FORWARD OBSERVER: What’s up and coming in (mostly) historical wargaming with reports on Jerwood, Warlord, Deep Cut, Knuckleduster, Timecast and Victrix. SEND THREE AND FOURPENCE: Part one of Civil War UK ‘79: Scenarios for Black Ops. 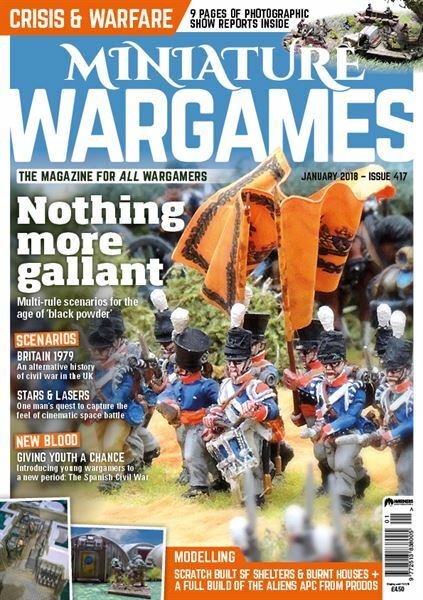 [COVER FEATURE] NOTHING MORE GALLANT: Tabletop scenarios for ‘black powder’ period games by Arthur Harman. EMBRACING CRISIS: The Editor takes his camera to Antwerp. PIG PEN PANDEMONIUM: The Editor gets scratch-build shed-tastic! FANTASY FACTS: The usual look-see at the latest news in F&SF gaming with releases from Black Pyramid, GZG, Slave 2 Gaming, Puppets War, CP, Warlord & Crooked Dice. ALIEN 3: Building the Prodos Aliens APC for the wargames table and more. STARS AND LASERS: A scenario for shooting the ship out of asteroids. WARFARE: The Editor makes a trip to the Reading wargames show.